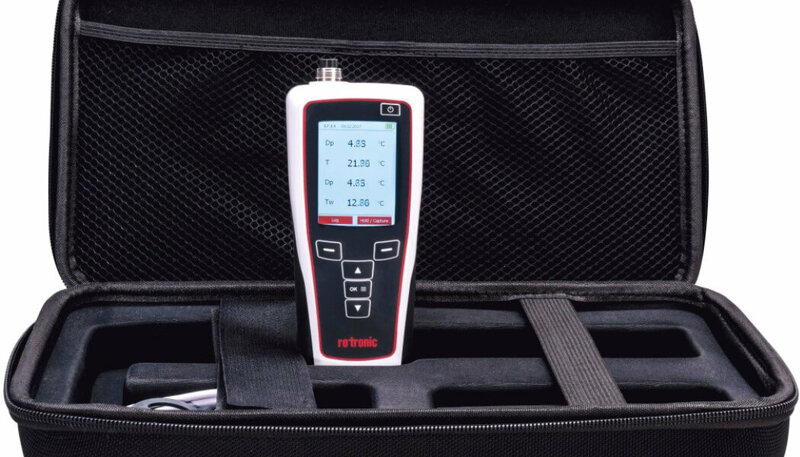 ROTRONIC has introduced its new HP32 temperature and humidity measurement handheld instrument. This precision instrument enables spot checks of temperature and humidity levels in museums, galleries and storerooms to be made easily, thereby ensuring artefacts are kept in a suitably maintained environment. It also means that energy costs can be reduced where energy usage is excessive. The HP32 handheld has an interchangeable probe input for all Rotronic HC2-series probes, full logging & spot value recording functions and much more. As well as temperature and humidity values, two other moisture parameters such as dew point and g/kg moisture for example can be displayed on the screen simultaneously. The handheld replaces the Rotronic HP22 model. The HP32 handheld is supplied with HW4-LITE version PC software, a micro USB data cable for PC connection & battery charging, and a soft protective case. A technical datasheet is available. Please order a suitable Rotronic temperature and humidity probe for the application such as the ‘standard’ HC2A-S probe. Extension cables are available to extend its capability, enabling measurements to be made in display cabinets and inaccessible areas.